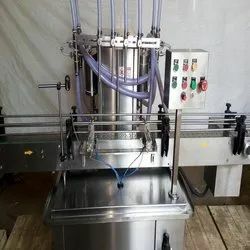 Edible Oil Filling machine offered comes in durable construction finish and is based on advanced volumetric principle with diving nozzles so as to offer quality performance support. Further, the unit comes in compact finish as well as delivers versatile performance. 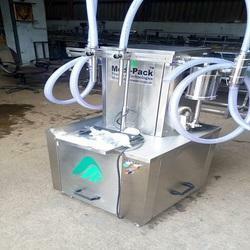 Some of its features include stainless steel elegantly matt finish, reciprocating nozzle with self-centering device, motor with synchronized variable A/c frequency drive, twin pneumatically operated stopper system and reciprocating nozzles for precisely matching for centering container below nozzles, ± 1% filling accuracy on single dose, no bottle no filling system and others. Automatic Servo Base Liquid Bottle Filling Machine work on Gravity and servo rotation base principle with diving nozzles. The unit is made compact,versatile and enclosed in stainless steel elegantly matt finish body, of S.S Slat Conveyor, Reciprocating Nozzle with self-centering devices SS Syringe. No container The main drive of the machine and conveyor drive consist of A/C Motor with synchronized variable A/c Frequency drive. The containers moving on S.S. Slat conveyor, feed below the filling nozzles through a settable twin pneumatically operated stopper system.The twin pneumatically operated stopper system and reciprocating nozzles can precisely match for centering of container below nozzles, to avoid spillage of liquid on container. The Filling Volume set by PLC AND HMI. This means fill size can be easily set. Automatic Sealing Capping Machine offered come backed by latest technology support and comes with support of large capacity electromagnetic hopper as well as vacuum stopper and mechanical positioning support. Further, the system also comes supported by microcomputer frequency modulator for handling of frequency speed adjustments. Some of its features include allows for regulation of stepless speed within rated capacity, offering safe and reliable operation support, offering stable highly efficient running support and others. Automatic Volumetric Liquid Bottle Filling Machine work on volumetric principle with diving nozzles. The unit is made compact,versatile and enclosed in stainless steel elegantly matt finish body, of S.S Slat Conveyor, Reciprocating Nozzle with self-centering devices SS Syringe. No container The main drive of the machine and conveyor drive consist of A/C Motor with synchronized variable A/c Frequency drive. ± 1% Filling accuracy on single dose. Rigid vibration free construction for trouble free performance. Elegant and easy control panel for total control on operation. Minimum change overtime, from one size to another container or fill size. Self lubricating UHMW-PE guide profile for SS slat chain provides low friction wear surface, smooth and noiseless conveying. Error code display on AC frequency drive on control panel. Drain tray around machine platform. Drip tray under the conveyor. Synchronized two nos. A/c drive for main motor conveyor belt. MCB for over load protection, and prevention against short circuit. Inbuilt protection against over current, Voltage fluctuation, Short circuit in AC Frequency drive. 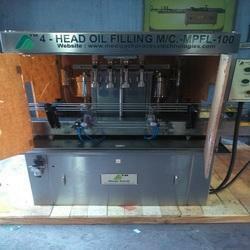 We are a well-known company, engaged in offering an exclusive range of Oil Filling Machines. Our offered machine is utilized in filling liquid materials in jar, can, tin, and drum in many industries. We offer this filling machine in different specifications and can be customized as per the specific requirements of customers. 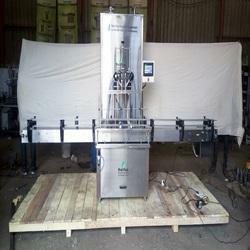 The offered filling machine is acknowledged in the market owing to its excellent functionality. 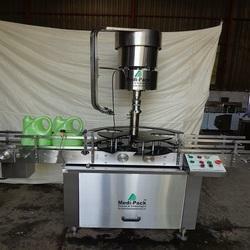 Mustard Oil Filling Machine offered find suitability for meeting the filling requirements of viscous and non-viscous liquids in industry sectors like chemical, daily, chemical industry and others. Further, the superior integration support for filling and capping in single machine also makes these optimum in performance. 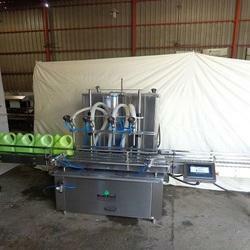 Some of its features include adopting low vacuum filling for ensuring high filling accuracy, no bottle no filling support, machine is easy to operate, applicable to provide filling support for glass bottle and plastic bottles; advanced microcomputer PLC programmable control system for consistent and precise performance. 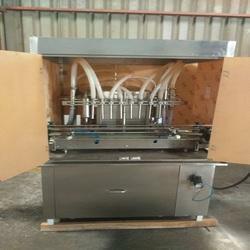 Semi Automatic oil Bottle Filling Machine offered finds use as a pneumatic liquid/paste filling machine and comes in compact designed finish so as to take minimum floor space while delivering maximum performance values. Further, these machines come with advanced pneumatic part including contact parts made of 304 stainless steel as per GMP requirements. Some of its features include allows adjustment of filling volume and filling speed, high filling , PLC control and touch screen support for precise operations, suitable for filling of non-carbonated water and other material; high production capacity, high filling accuracy and others.